On the Coupler curve Equation or planar Inverse Four-bar Parallelogram Linkages Xie Jin, et al. Optimal Design for the Tooth Profle of the Cone-Generated Enveloping Cylindrical Worm Drive With two Degree or Freedom Dong Ming, et al. The Optimal Design of Crand-Type In volute Planetary Gear Drive Li Aijun,et al. Analysis and Research on the Thermal E lasto-Hydrodynamic Lubrication of Involute Gears Lu Lixin,et al. Features of Fatigue Cracks in Gears and Diagnosis Methods Zhang Guicai,et al. 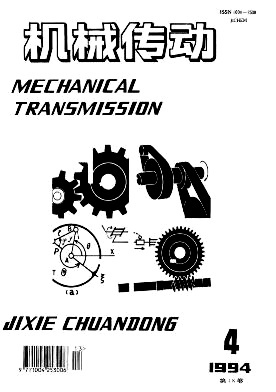 Research on the Quality Test of Gearbox from the Vibration Signals Ji Guoyi,et al. An Analysis of Focres in Planetary Gears with Inner Planet Gear Zhang Suohuai, et al. Pattern Distinguished Based on the Fuzzy Similarity Nearness for the State Recognition of Rotating Machinery Yu Chengbo,et al. The Research on the Tooth Shape Synthesis and Formation Method of Cycloid Steel Ball Reducer Zhang Rongxian,et al. Determination of parameters Belleville Springs for Tsubaki Disco Feng Chengzhou,et al. Study on the Output Capacity of DISCO Variator Cui Yahui,et al.